During the last 2 – 3 months both print and electronic media are continuously reporting that increase in 7th CPC Minimum Pay and Fitment Factor is under serious consideration of the Govt. and National Anomaly Committee will give its recommendation to Govt. and orders for increased Minimum Pay and Fitment Formula will be given effect from April 2018. We are reproducing below a letter from Govt. dated 30.10.2017 addressed to Secretary, Staff Side , National Council JCM stating that the demand for increase in Minimum Pay and Fitment Formula will not come under the purview of National Anomaly Committee. Further Govt. has not yet constituted the HIGH LEVEL COMMITTEE for increasing Minimum Pay and Fitment Formula as assured by the Group of Ministers including Home Minister Sri Rajnath Singh, Finance Minister Shri Arun Jaitley on 30.06.2016. The so-called Senior Officers Committee has also not discussed this agenda even though staff Side has repeatedly demanded discussion and settlement as per the assurance given by Senior Cabinet Ministers. Now 17 months are over. 32 lakhs Central Govt. Employees and 33 lakhs Pensioners are being continuously betrayed by the NDA Govt. 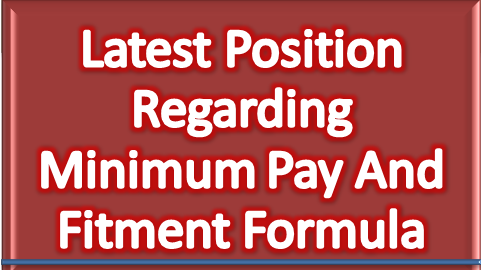 Latest position regarding Minimum Pay and Fitment Formula - Govt informed Staffside National Council JCM that increase in Minimum Pay and Fitment Formula will not come under Anomaly Committee Item.